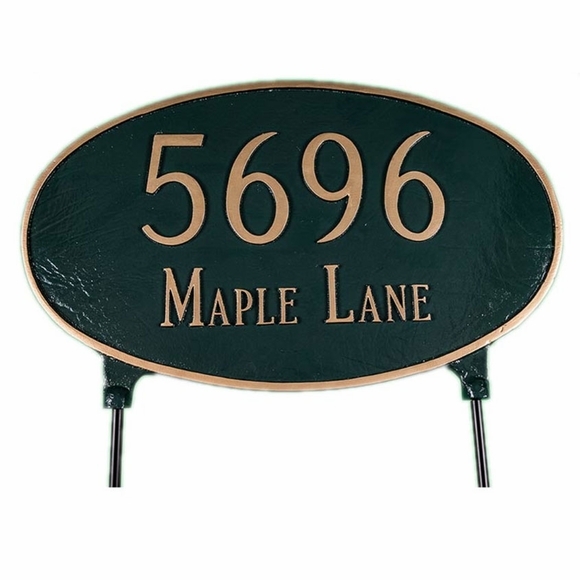 Large Oval Personalized 2 Sided Lawn Sign - - comes complete with two 17" lawn stakes. Made in USA. Holds one or two address lines. The same lines appear on both sides of this sign. Custom made with your home identification information and color scheme selection. Line 1 holds up to five characters and is generally used for the house number. Line 2 (optional) holds up to 17 characters (including spaces) to identify your street, family, town, or business name. This sign is made specifically for lawn mounting and comes with two 24" stakes. Holds up to four 4" characters on line 1 and up to 17 characters on line 2. If you are using line 1 only, then the sign can hold up to to five 5" characters. NOTE: Please be sure not to exceed 4 characters on Line 1 UNLESS you are ordering a one-line sign. If ordering a one-line sign, please leave line 2 blank. This two-sided sign also comes in a hanging version (see Related Products). Sign beautifully done. Better than I expected. Thanks for a great job.